7-Jan-2014 by THF in Hoot's Corner | Comments Off on UFC tolerating steroid use? Does the UFC’s lax policy on allowing fighters to use TRT equate to providing an okay to steroid use? The UFC champ hopes the Nevada Commission will be keeping a very close eye on challenger Vitor Belfort’s testosterone levels and steroid use when and if they meet to battle for UFC gold. The 36-year-old Belfort failed a post-fight drug test for steroids following a 2006 loss toDan Henderson at a Pride event in Las Vegas. Rather than serving out his full suspension, Belfort took fights in the UK and had to petition to be allowed to fight again in the U.S. He has since been giving clearance to use testosterone replacement therapy (TRT) while fighting for the UFC, mostly in Brazil. 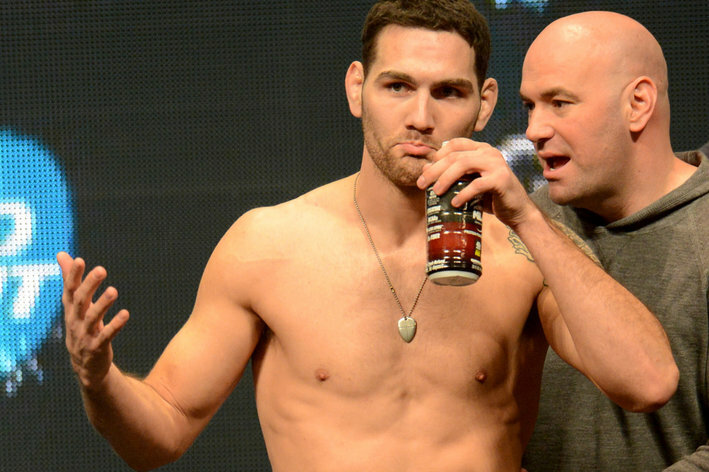 Weidman just defended his belt for the first time, defeating Anderson Silva, the man he took the title from in July, via TKO in the second round at UFC 168. The Belfort match has yet to be signed although it is hoped that it will be booked in May of this year.